Birinci's Flintis (also known as Flenters) was out of Pinarbasi's Tamum (Charlie) and sired by Ulash of Tokat imported from Turkey. Little did Louise Emanuel know when she bred this pup that he would one day be famous around the globe. Born in March of 1994 and then donated to the Cheetah Conservation Fund in Namibia, Flintis earned his fame by defending his stock against a troop of baboons. Flintis was placed with Mr. Johann Coetzee who had reported severe losses of lambs and kids due to the neighboring cheetah population. Mr. Coetzee named him Flenters meaning "rags" and as a six week old pup placed him with lambs and goats about his size. Flintis grew and began to become more and more watchful and responsible for his herd. He would keep them in the shade when it was hot, lead them from place to place in the pasture and ward off predators including jackals, caracals and baboons. 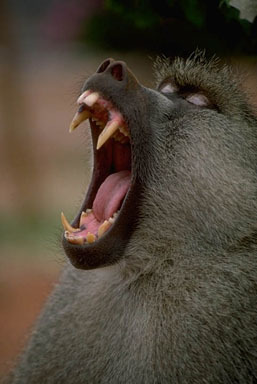 Baboons are some of the most deadly predators in the whole of Africa. Their razor sharp teeth are designed for slashing and tearing, they have extraordinary speed, agility and power and they work in troops making their ferocity all the more enhanced. Male baboons typically weigh 70-90 lbs and are capable of incredible speed. When dog meets baboon, it is expected that the dog will die. In December of 1995 (Flintis was only 20 months old), Flintis was on guard in the sweltering heat of the African summer with temperatures nearing 100 degrees. A troop of baboons came near the corral holding lambs and kids. Flintis assumed a protective position but the two dominant male baboons continued coming. Flintis stood his ground. Flintis' herdsman, Mattias, heard the noise of the fight and ran to tell Mr. Coetzee. By the time the reached the area of the fight, the first baboon was dead and Flintis was in fighting with the second. This fight covered over a mile in area. When Mattias and Coetzee reached the location of the fight the second baboon lay dead and Flintis blood-soaked body lay motionless as well. His back had been slashed open to the bone and he was barely alive. Coetzee carried Flintis back to the shade and began tending his wounds before carrying him home. After five days of intensive antibiotic treatments, no food or drink and low expectations, Flintis began to come around. 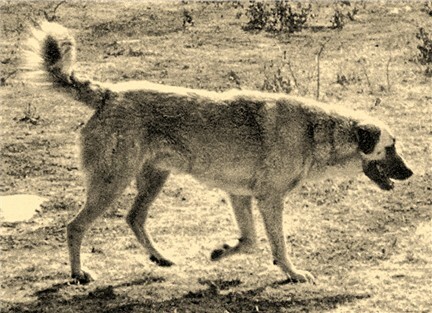 Eight days after the attack, Flintis was trying to rejoin his herd. In a few more days he was allowed to return to the herd and he continued his recovery in the company of his charges. Thank you to Erick Conard for the majority of this information and to Louise Emanuel for breeding such a wonderful guardian dog.